Table clock; painted wood, metal, glass; original electrical wiring. 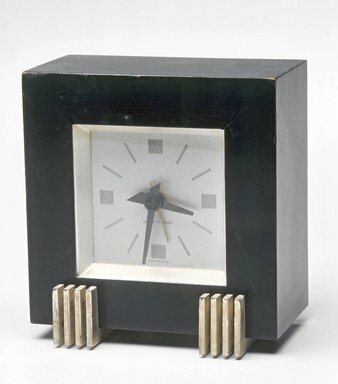 Clock is black wooden rectangular shape raised on two L shaped gold metal felted supports that rise at right angles on front bottom of clock as four short prongs. Brushed gold metal square face with metal hour, minute, and second hands. Triangular hour and minute hands are black; second hand is gold. Thin black lines replace numbers on clock face. Back covered by metal plate. One time-set dial on back. CONDITION: Good; painted surface shows peeling around edges particularly corners, wood shows small dents, metal feet show wear; excess glue around printed label on bottom.